Parking – Large lot on Zion Road, another off of School House Road. Dog friendly? Yes, as long as on a leash. Stroller friendly? If you have big tires, this should be manageable on several of the trails. Benches? I don’t remember seeing any. Facilities? : A port-a-potty in the parking lot. Not sure if facilities are available at the nature center. Standouts – Beautiful views of the lake, great spot for birding. Markings – None official, but someone put tape up on the various trails recently, which was helpful. With the web of trails, it would be really great if they officially blazed the trails and had a color-coded trail map. Description – So last month, the Wife had work Saturday morning, so The Pres, Tree Rider, and I set out for a day of adventuring. 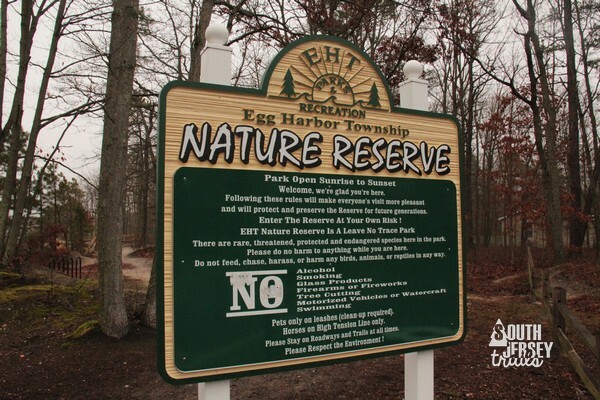 Our goal for the day was the Egg Harbor Township Nature Reserve, which I’d stumbled upon a few years ago while trying to drive from Ocean City in a blizzard (long story). A glance from the trailhead told me that I had to come back here someday and hike here, and this was the day! To start, the trails here are only unofficially blazed (and that was a recent job), and are a vast web, so it’s a good idea to either leave a lot of time, or to download a handy, dandy GPS app for your phone to keep track of where you are. Anyway, enough with all that, let’s reserve some nature! We headed in from the parking lot on Zion Road, heading right and taking the trail along the rim of the lake area. You can tell its a good sized drop to the bottom, because the reserve has a designated sledding hill (complete with steps to help you get back up) that, from all reports, is awesome. Handy, dandy steps to get back up the hill. At this point, we took a sharp right turn to check out the woods side of the park first. We headed down the trail and quickly lost sight of the large, manmade lake. On the map, this would be the first right that you can make. The trail looped around, and we headed due north until the trail hit a “T” intersection. There, we turned left and soon found ourself peeking through the trees back out at the lake again. Turning left to continue on the trail. Big group of birds floating out in the lake. We headed back into the woods, meandering through the web of trails until we hit the powerline cut, which separates the main part of the park from a little offshoot north of the power lines. Turn right, stay in the woods! Well, take a peak at the lake first. We opted to skip the part across the power line cut, instead turning left and walking along the power lines. We turned left to get back into the woods, but managed to backtrack to where we’d already been, so we came back up to the powerline cut via a different trail. Right around here, we talked with a fellow for a minute or so who was out mountain biking. After I posted a picture on the Facebook later, we realized we had bumped into each other earlier in the day, so hi John! Coming back up to the powerline cut. Back at the power lines. Now I knew exactly where we were, so we headed left and walked down to where the power lines near the lake. A jog in the trail put us on the back end of that lake, still up high on the rim. Trail jogs to the left to approach the rim of the bowl that the lake sits in. Along the edge of the bowl on the back end of the lake. Sometimes, I pretend to be a real nature blog. Or photography blog. Because if there is one thing this blog needs, its another chance to lose focus! We followed the rim about halfway down the back end, dodging a monster tree and checking out some old concrete pipes along the way. Then we opted to drop down the steep slope to get a close up look at the lake. Monster… oh wait, that’s just The Pres. Never a bad excuse for a panorama shot. Dropping down to the floor of the bowl by the lake for a closer look. Being by the side of the lake let us pick up the trail down there AND put us closer to the birds in the lake, which made The Pres really happy. The lake is dotted with islands, some of which have large pipes on them, which makes for some interesting views. From here on out, the trail wanders along the edge of the lake. We went around the back corner, and made out way toward the the Nature Center, eventually arriving to some chunks of bog iron that are on the lakeside. Back end of the lake, by the power wires. Now on the side of the lake, walking away from the power lines and toward the nature center. Hemmed in by some steep sides along this stretch of trail. From here, we rounded the final corner and slowly climbed above the lake, arriving shortly back at the parking lot. The total hike had been 3 1/4 miles, a good stretch of the legs. Sledding hill across the lake. Back end of the lake, almost back to the parking lot! Despite the damp and the fog, this was a great hike. I loved the differences between the lake part of the hike and the forest, and both left plenty to look out for. There is also a short nature trail to the left of the lake that we didn’t get to, so really a bit of everything. This one will definitely make our top 10 for 2017. Nearby – Estell Manor County Park is relatively nearby. I’ve never heard of this one. Thanks!! We’ll be checking it out soon. It’s not particularly wild, but I liked the contrast of an area returning to wild with the large pipes pieces that have been left there. You may also want to check out Cox Hall Creek WMA in the Villas. It’s an old golf course that has been converted to a WMA and managed by the State now. It has mostly paved paths, the old golf cart paths, and one short unpaved trail. It’s a neat place to see how the highly managed golf course is reverting back to a natural area. Definitely! I also heard it was a former beer baron’s estate, so I feel like I can’t lose! Thank you for to the tip! My favourite place to walk with River (my always leashed dog). We both love it there. Great pictures! There are a few benches on the trail by the nature center. Well — I said I would get out here one day — and doggone it…today (4/9/17 to be exact), I did just that!! I believe I said it before, but thank you for this blog…still in amazement that someone not from this area knew about this neat park _when I didn’t_! One reason I came back to this particular blog entry (other than to comment) was to see if the temporary trail markers were up back then — looks like they were! If I were retired, I swear I would volunteer my time to put permanent blazes on the trails (and perhaps color-code the existing map to reflect the colors!) I explored a great portion of the park; I noticed the orange markers seemed to be all over the place! Not sure if it is one huge trail, or maybe just contains placeholders for different color markers in the future. I noticed the “Monster Tree” as well, but for some reason, didn’t get a picture of it. I guess I have seen this sort of thing on other trails in the past, so I didn’t feel the need to get a shot of it. But one thing I *did* get a shot of was along the Orange Trail, after making the first left turn and heading into the long “tree archway” — someone painted words on a few of the trees. I couldn’t make out what 2 of them were, but there was one that said “Insane” (tagged in red spray paint.) Not sure if I should have laughed, or been angry that some people have nothing better to do than deface a nice Nature Reserve. O.K. — enough rambling…just excited to be able to finally get out to this wonderful nature reserve that you highlighted in your blog! Looking forward to future adventures from you, The Pres and Tree Rider! I am very concerned about certain people who are fishing in the nature reserve. I went there on Tuesday, June 20, 2017 and saw nine grown men with surf rods and a large knife stuffed into the dirt. They were keeping everything they caught. The police came and all the men did was move to the other side of the reserve.They are destroying the reserve. The sign states do not harm anything in the reserve. Clearly they ignored the sign. I am very distraught at the lack of compassion for the preservation of nature. I called the US fish and wildlife NJ field office and not one person seemed concerned. I left several messages and it was not important enough to get back to me. So sad to see! The reserve needs to be monitored or it will be destroyed. That’s a shame. I believe the township owns the reserve, maybe try the local politicians?